I know this isn't the first time someone has made these kinds of things available on the web, but here's a nice collection of pdf format printable shopping lists of various types. Every time I try to download it says no such design? False Alarm, had to enable No-Script! shopping lists - neat idea - if it was electronic. i use these two in an attempt to keep my groceries' list in order. but not sure if it's downloadable to a mobile phone. Only print, but if some of the smart people here at DonationCoder made a small program. put it up on the DC server's and made it possible to members to access. and after we have made the beta testing we can sell this service to more people how are whimsy like me. 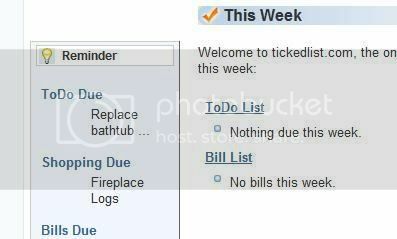 www.tickedlist.com is not bad. The printable list is designed not to waste ink with too much fancy stuff and also it has a mobile site so you can browse your list on your phone. Also it shows you how much you've been spending each month with graphs and also remembers past items so creating a new list is fast. Hey, thanks for that link. I just signed up and I'm giving it a try. The only thing I can't figure out is when I create a task it doesn't show up on the Today page as due. I created a task due today but Today shows nothing due. The funny thing is that in the left sidebar it shows the task as due. I notice there is no help on the site and no contact info. I use HandyShopper, freeware for Palm. There's a Windows Mobile version too. hmm I never noticed that problem until today. I've noticed they've been upgrading the site recently... maybe they screwed something up along the way. Hey, looks like its been fixed. When I add a new todo item with today's date it's immediately shown on the today screen. Check out this interactive grocery list . It's a neat idea but needs a mobile app to go with it. I hate printable lists that I have to write down because I always lose them before I make it to the store. I think some of the supermarkets had online shopping in actuality. You bought stuff just like you would at an online bookstore. Then they charged a delivery fee on top. I think they discontinued because 1) cost of gasoline went way up and 2) it killed impulse buying while searching for the stuff on your list. A lot tougher to get lost in an online store. One really nice thing about http://www.freeprintablegrocerylist.com/ is that you can download the lists in .doc format and they are really easy to edit and customize (if you have MS Word that is). It's nice to make a custom grocery list of stuff you regularly shop for. My ToDo List application was designed to be very simple, and the simplicity of it makes it quite powerful for use in making shopping lists. Enter all the things you need to buy on the ToDo side and print it. You'll get a sheet with little boxes to check off. When you get home, move all the items you did buy to the Done side. Next time you need to go shopping, you will not only have the list of things you didn't buy waiting on the ToDo side, but the Done side has all the stuff you have previously purchased, ready to select and move back to the ToDo side and buy again. You have no idea how great this is to prevent you from forgetting to add things to your list. It kind of does half the thinking for you. You can keep a separate list for every different type of shopping you need to do: one list for groceries, another for office supplies, one for your kid's school supplies, another for a party or specific project. Lists are stored as 2 separate plain text files, one for ToDo and other for Done. Since they are plain text, you can copy either of them and change the file extension to .txt and do the same things with them as any other plain text file, including storing a copy on your mobile device or emailing it to someone that doesn't have a copy of the software. Nice as a reminder list! I use http://www.Grocerywiz.com and it works great! I use <removed link> and it works great! You already posted a similar reply on this thread. That, combined with this google search leads me to think that you must have some relationship with the product you are plugging. If you are indeed associated with it, the forum rules request you to explicitly acknowledge so.